SOCIAL media savvy Malaysians have recently been confronted with a sad and ugly side of mankind. Once again, online platforms have been flooded with sights of bystanders taking photos instead of helping people in need. For over a year now, I have had the pleasure to be published here on a regular basis. My stories cover a variety of subjects, from public holidays to festivals, from food to traffic. My aim however, hardly changes. As a grateful and long-term guest, I tell you about the sheer inexhaustible ways in which your country is charming, appealing and fascinating. I speak of the good luck we have, to be welcomed on your shores. It’s an easy task, Malaysia is truly a little piece of paradise. Among all the bad news, the critical voices featured in newspapers around the world, we all need to be reminded that not all hope is lost. We need to be aware and thankful for the good people, the good deeds happening all around us every day. And yet, time has come for a feature of a different kind. 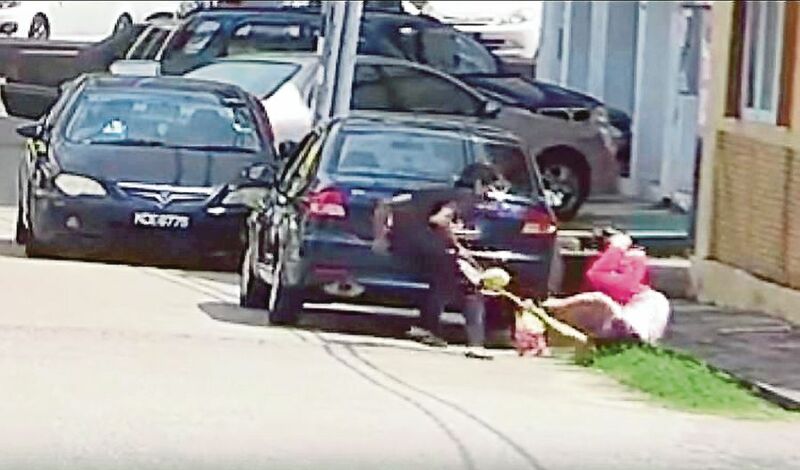 A short video has recently appeared online, showing a side street in a quiet neighbourhood. The type we all know, single-storey bungalows on both sides, a small ditch separating the front yards from the road, and of course, a couple of cars parked where they are not really supposed to be. Maybe there’s a wet market nearby, or a shop lot, frequented by residents. The sun is shining; the street is deserted. Around the corner comes a lady, weighed down by a couple of shopping bags. She reaches one of the cars, puts down her belongings, and unlocks the door. Then, events follow in rapid succession. A car door opens behind her. A man emerges. He grabs her bag. He pushes her over with brute force. His accomplice picks up the assailant and they drive off, leaving the lady lying by the roadside, injured. Seconds later, a man on a motorbike approaches. He slows down, he looks over, he passes the victim, and stops across the road. Does he rush over to see to her? Does he grab his phone to call for help? No. He grabs his phone all right, but he takes pictures! The assaulted lady moves, rolls over and falls head first into the ditch. The last few frames of the video show the quiet neighbourhood street, the bike rider taking photos, and a pair of legs sticking out of the drain. This is an aberration. We can all agree on that. But the shocking truth is that today, this is the norm rather than the exception. People stop at the site of an accident, in front of a burning house, on a bridge next to a desperate youth ready to jump — and take photos. This is not a Malaysian phenomenon, mind you. The German government has enacted a law punishing anyone who takes photos of a crime or accident instead of helping. Gawkers will face hefty fines or even jail time. Germany’s need for such a law does not embellish the fact that what is known as bystander apathy happens here too, much too often. Malaysians are caring and kind. People readily aid a mother with a stroller navigate the escalator of a mall. A passer-by will offer his assistance to a lost tourist. A shop assistant will help a customer carry purchases to their car. Many drivers stop on the highway and offer support when a car breaks down. Not something I have observed in many other countries. But, when we witness an emergency, most of us stop and do nothing. Or we watch and take pictures. Many of us consider ourselves to be assertive and moral individuals, yet our convictions are not backed by our conduct. Has our moral courage been overwritten by our need to excel at social media shrewdness? Bystander apathy or altruistic inertia is not a new occurrence. On a global and terrifying scale, it enabled some of history’s darkest chapters, like the Holocaust or the Rwandan Genocide. Taking pictures is the logical, even if erroneous, next step. The good news is: altruism and social responsibility are teachable skills. We can ask ourselves “What would I do?”, we can mentally prepare for an emergency, so as not to be caught off guard and do nothing, when we should help. We can lead by example, as one rescuer will inevitably motivate others to follow suit. We can overcome our fear of responsibility for the sake of a new generation of truly altruistic citizens. Later we can post this act of true heroism on social media, with a smiley face in lieu of a photo.